The Crusades vs. The Three Caliphates (Moral Equivalence). (CAUSES OF WARS) A recent comprehensive compilation of the history of human warfare, Encyclopedia of Wars by Charles Phillips and Alan Axelrod documents 1763 wars, of which 123 have been classified to involve a religious conflict. So, what atheists have considered to be ‘most’ really amounts to less than 7% of all wars. It is interesting to note that 66 of these wars (more than 50%) involved Islam, which did not even exist as a religion for the first 3,000 years of recorded human warfare. Even the Seven Years’ War, widely recognized to be “religious” in motivation, noting that the warring factions were not necessarily split along confessional lines as much as along secular interests. Even the Seven Years’ War, widely recognized to be “religious” in motivation, noting that the warring factions were not necessarily split along confessional lines as much as along secular interests. 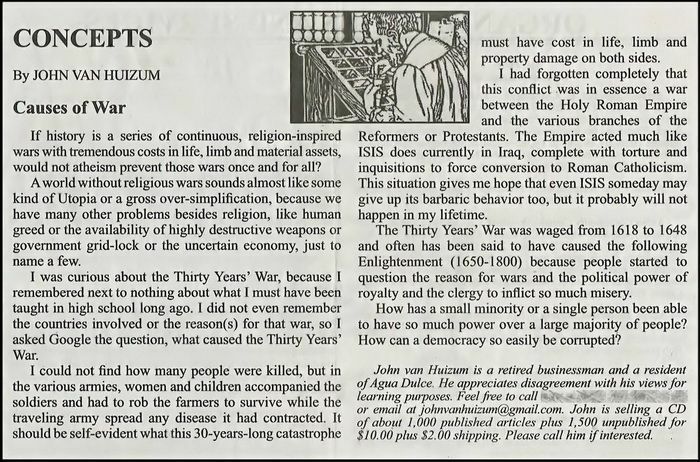 And the Thirty Years’ War cannot be viewed as “religious” in that you should find certain aspects if this were the case…. (STAND TO REASON) Not only were students able to demonstrate the paucity of evidence for this claim, but we helped them discover that the facts of history show the opposite: religion is the cause of a very small minority of wars. Phillips and Axelrod’s three-volumeEncyclopedia of Wars lays out the simple facts. In 5 millennia worth of wars—1,763 total—only 123 (or about 7%) were religious in nature (according to author Vox Day in the book The Irrational Atheist). If you remove the 66 wars waged in the name of Islam, it cuts the number down to a little more than 3%. A second [6-volume] scholarly source, The Encyclopedia of War edited by Gordon Martel, confirms this data, concluding that only 6% of the wars listed in its pages can be labelled religious wars. Thirdly, William Cavanaugh’s book, The Myth of Religious Violence, exposes the “wars of religion” claim. And finally, a recent report (2014) from the Institute for Economics and Peace further debunks this myth. William T. Cavanaugh, The Myth of Religious Violence (New York, NY: Oxford University Press, 2009). 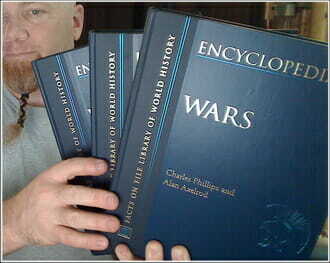 Gordon Martel, The Encyclopedia of War, 5 Volumes (New Jersey, NJ: Wiley, 2012). Atheists often claim that religion fuels aggressive wars, both because it exacerbates antagonisms between opponents and also because it gives aggressors confidence by making them feel as if they have God on their side. Lots of wars certainly look as if they are motivated by religion. Just think about conflicts in Northern Ireland, the Middle East, the Balkans, the Asian subcontinent, Indonesia, and various parts of Africa. However, none of these wars is exclusively religious. 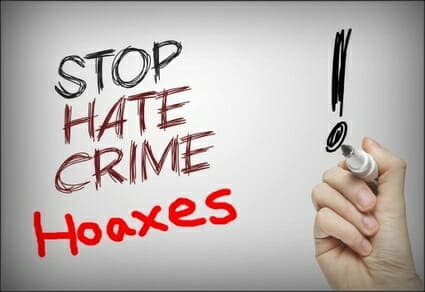 They always involve political, economic, and ethnic disputes as well. That makes it hard to specify how much [of a] role, if any, religion itself had in causing any particular war. 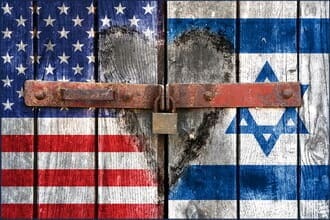 Defenders of religion argue that religious language is misused to justify what warmongers wanted to do independently of religion. This hypothesis might seem implausible to some, but it is hard to refute, partly because we do not have enough data points, and there is so much variation among wars. 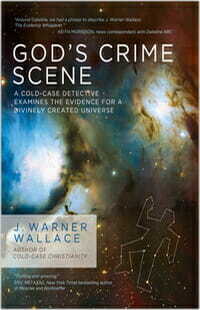 Walter Sinnott-Armstrong, Morality Without God? 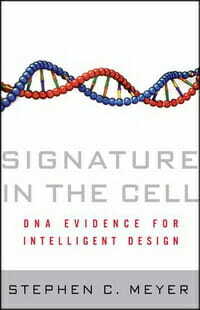 (New York, NY: Oxford University Press, 2009), 33-34. In France, following the Reformation, Calvinists known as Huguenots sprang up in large numbers. The Roman Catholic establishment persecuted them. Manipulated by French political leaders, the Huguenots rose to defend their rights. Their behavior and methods in turn outraged Catholics. War ravaged France. 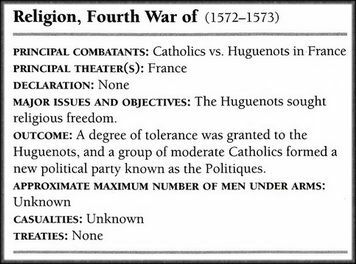 Although fewer in numbers than their foes, the Huguenots fought so fiercely they managed to extract concessions which allowed them to build churches and manage affairs in cities where they had majorities. But the bloodshed imprinted lasting animosity between Protestants and the Catholic majority. Out of this smoldering hatred flared up one of the most regrettable events of church history. On August 22, 1572 an attempt was made in Paris to assassinate Huguenot leader and French patriot Coligny. Wounded, he returned home to recover. Accounts disagree as to what happened next and who was responsible. Late on this day, August 23, 1572, armed men, led by the Guises, broke into Coligny’s apartment, overcame the fierce resistance of his guards and killed him. Coligny’s death was the signal for a general butchery of the Huguenots. This atrocity is known to history as the St. Bartholomew’s Day Massacre because it lasted well into that saint’s day. 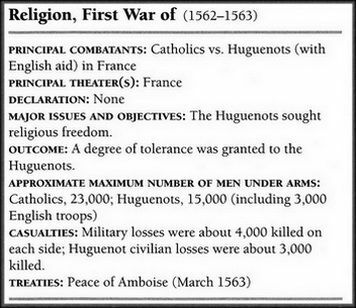 Catholics slaughtered Huguenots in cold blood into the morning of the 24th in Paris and for days in outlying regions. As many as 70,000 perished. The rest fled to fortified cities and fought back. Their movement became known as La Cause (The Cause) and pitted them against The Holy League (La Sainte Ligue). Brutal fighting raged across the French kingdom. Charles IX publicly claimed he had ordered the massacre. Certainly the Paris constabulary were warned in advance to prepare for disturbances. Many historians have seen the plot as the work of Catherine de Medici, who felt her power threatened. Possibly Charles, by taking credit, was trying to reap a political benefit from the gruesome event. If so, he won no plaudits outside Catholic regions. Pope Gregory XIII struck a special medallion to commemorate the “holy” act but most other European reaction was horrified. Charles himself suffered psychological agonies from the affair. The Massacre of St. Bartholomew was not the end of the matter. 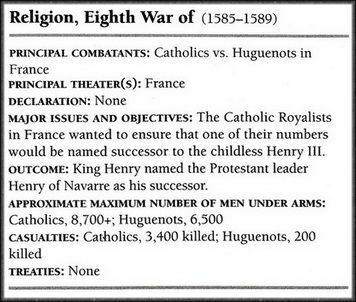 When the Protestant Henry of Navarre converted to Catholicism in order to become king, he granted his Huguenot compatriots a number of rights under the Edict of Nantes. These rights were gradually eroded, more Huguenot revolts occurred and, finally, 400,000 fled the country into voluntary exile under Louis XIV. Alan Axelrod & Charles Phillips, Encyclopedia of Wars, Vol II (New York, NY: Facts On File, 2005), 931-936. On March 1, 1562, supporters of the Catholic duke Francois de Guise (1519-63) killed a congregation of Protestants at Vassy. 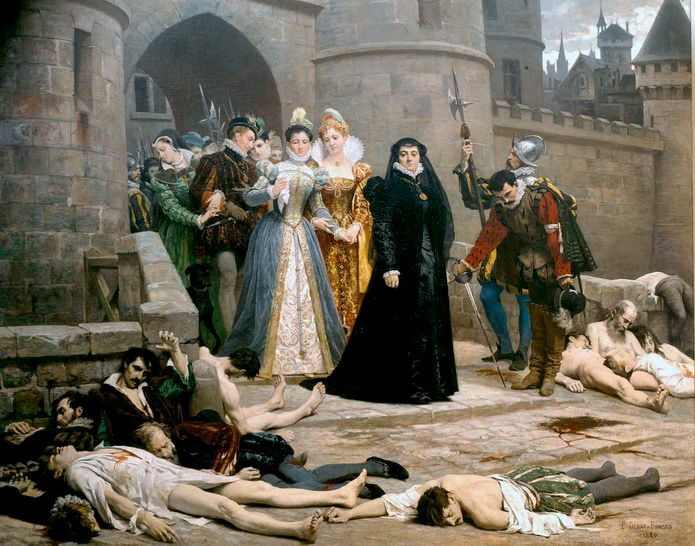 This massacre was instigated by the granting of limited toleration to the Protestants by Cather­ine de’ Medici (1519-85), the queen mother who took control of the throne at the death of King Francis II (1544­60). The Catholics, under Francois de Guise, the Consta­ble de Montmorency (Anne, duc de Montmorency; 1493­1567), and Prince Antoine de Bourbon (1518-62), king of Navarre, and the Protestants, under Louis I de Bourbon, prince of Conde (1530-69), and Comte Gaspard de Col-igny (1519-72), admiral of France, were soon pitted against each other in a battle known as the First War of Religion. Louis de Conde and Gaspard de Coligny ordered the Huguenots to seize Orleans to retaliate for the Vassy massacre and called on all Protestants in France to rebel. In September 1562, the English sent John Dudley (fl. 16th century) of Warwick to help the Huguenots, and his force captured Le Havre. About one month later, the Catholics defeated Rouen, a Protestant stronghold. One of the lead­ers of the Catholic movement, Antoine de Bourbon, was killed during the attack. The Huguenots continued to rise in rebellion, and in December 15,000 Protestants under Conde and Coligny marched north to join the English troops at Le Havre. En route, they encountered about 19,000 Catholics at Dreux. The Catholics under Guise were victorious, but one of their leaders, Montmorency, was captured, as was the Protestant leader Conde. 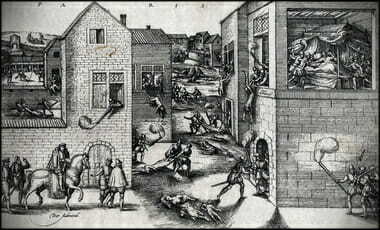 On February 18, 1563, Guise was killed while besieging Orleans. Peace was finally secured in March when Mont­morency and Conde, both prisoners since the Battle of Dreux, negotiated a settlement at the request of Queen. Catherine. The Peace of Amboise stipulated a degree of tol­erance. The opposing sides then combined forces to push the English from Le Havre, which fell on July 28, 1563. The Peace of Amboise (July 28, 1563), which stipulated a greater degree of tolerance between the Catholics and the Huguenots in France, ended the First WAR OF RELI­GION. However, peace lasted only four years. On September 29, 1567, the Huguenots under Louis de Bourbon, prince de Conde (1530-69), and Comte Gaspard de Coligny (1519-72) tried to capture the royal family at Meaux. Although they were unsuccessful, other Protestant bands threatened Paris and captured Orleans, Assent, Vienne, Valence, Nimes, Montpellier, and Montaubon. At the Battle of St. Denis, a force of 16,000 men under Constable de Montmorency (Anne, duc de Montmorency; 1493-1567), attacked Conde’s small army of 3,500. Despite the long odds, the Huguenots managed to remain on the field for several hours. Montmorency, aged 74, was killed during the fray. This war ended on March 23, 1568, with the Peace of Longjumeau by which the Huguenots gained substantial concessions from Queen Catherine de’ Medici (1519-85). The Third War of Religion broke out on August 18, 1568, when Catholics attempted to capture Louis de Bourbon, prince de Conde (1530-69), and Comte Gaspard de Coligny (1519-72), the primary Protestant leaders. The Royal­ist Catholics continued to suppress Protestantism. Sporadic fighting occurred throughout the Loire Valley for the remainder of 1568. In March 1569, the Royalists under Marshal Gaspard de Tavannes (1509-73) engaged in battle with Condes forces in the region between Angouleme and Cognac. Later in March, Tavanne crossed the Charente River near Chateauneuf and soundly defeated the Huguenots at the Battle of Jarmac. Although Conde was captured and murdered, Coligny managed to withdraw a portion of the Protestant army in good order. About three months later, help for the Huguenots arrived in the form of 13,000 German Protestant reinforcements. This enlarged force laid siege to Poitiers. Then on August 24, 1569, Col-igny sent Comte Gabriel de Montgomery (c. 1530-74) to Orthez, where he repulsed a Royalist invasion of French-held Navarre and defeated Catholic forces arranged against him. Royalist marshal Tavanne then relieved Poitiers and forced Coligny to raise the siege. The major battle of the Third War of Religion occurred on October 3, 1569, at Moncontour. The Royalists, aided by a force of Swiss sympathizers, forced the Huguenot cavalry off the field and then crushed the Huguenot infantry. 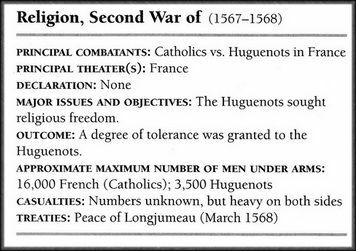 The Huguenots lost about 8,000, whereas Royalist losses numbered about 1,000. The following year, how­ever, Coligny marched his Huguenot forces through cen­tral France from April through June and began threatening Paris. These actions forced the Peace of St. Germain, which granted many religious freedoms to the Protestants. A massacre of 3,000 Protestants and their leader Louis de Bourbon, prince of Conde (1530-69), precipitated the out­break of the Fourth War of Religion between Catholics and Protestants in France. After the massacre of St. Bartholo­mew’s Eve in Paris, August 24, 1572, Prince Henry IV of Navarre (1553-1610) took charge of the Protestant forces. Marked primarily by a long siege of La Rochelle by Royalist forces under another Prince Henry, the younger brother of Charles IX (1550-74), this Fourth War of Religion resulted in the Protestants’ gaining military control over most of southwest France. 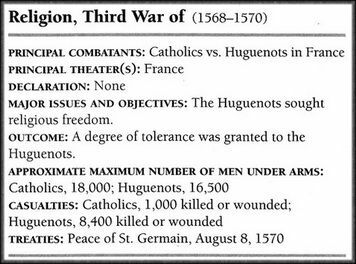 However, at least 3,000 more Huguenots were massacred in the provinces before the war ended. The St. Bartholomew’s Day Massacre outraged even Catholic moderates, who, seeking to counter the extremes of the Catholic Royalists, formed a new political party, the Politiques, to negotiate with the Protestants and establish peace and national unity. Protestants and Catholics in France had been fighting spo­radically since 1562 in the First War of RELIGION, the Sec­ond War of RELIGION, the Third War of RELIGION, and the Fourth War of RELIGION when violence again erupted in 1575. In the most important action of this war, Henry, duc de Guise (1555-88), led the Catholic Royalists to victory at the Battle of Dorman. Aligned against Guise, however, were not only the Protestants under Henry IV of Navarre (1553-1610) but also the Politiques, moderate Catholics who wanted the king to make peace with the Protestants and restore national unity. Henry III (1551-89) was not wholeheartedly in support of Guise, and he offered pledges of more religious freedom to the Protestants at the Peace of Mousieur, signed on May 5,1576. Guise refused to accept the terms of the peace and began negotiating with Philip II (1527-98) of Spain to organize a Holy League and secure Spain’s help in capturing the French throne. 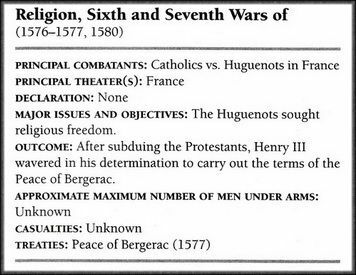 The Sixth War of Religion between the Catholics and Protestants in France included only one campaign and was settled by the Peace of Bergerac of 1577. During this period, Henry III (1551-89) tried to persuade the Holy League, formed in 1576 by Catholic leader Henry, duke de Guise (1555-88), and Philip II (1527-98) of Spain, to support an attack on the Protestants. Henry succeeded in subduing the Protestants but wavered in his determina­tion to carry out the terms of the Peace of Bergerac. The Seventh War of Religion in 1580, also known as the “Lovers’ War,” had little to do with hostilities between the Catholics and Protestants. Instead fighting was instigated by the actions of Margaret, the promiscu­ous wife of Henry IV of Navarre (1553-1610). Over the next five years, Catholics, Protestants, and the moderate Politiques (see RELIGION, FOURTH WAR OF; RELIGION, FIFTH WAR OF) all engaged in intrigue in their attempts to name a successor to the childless Henry III. Although Henry of Navarre was next in line by direct heredity, the Holy League maneuvered to ensure that Henry, duc de Guise, would gain the throne after the reign of Charles de Bourbon (1566-1612), proposed as the successor to Henry III. 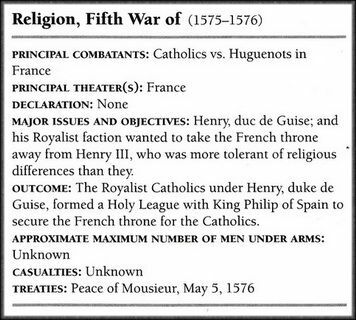 The Eighth War of Religion, also known as the “War of the Three Henrys,” pitted the Royalist Henry III (1551-89), Henry of Navarre (1553-1610), and Henry de Guise (1555-88) against each other in a struggle over succession to the French throne. The war began when Henry III withdrew many of the concessions he had granted to the Protestants during his reign. 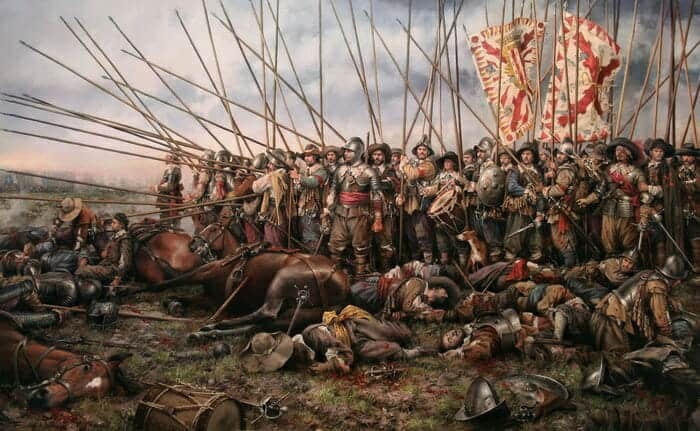 At the Battle of Coutras on October 20, 1587, the army of Henry of Navarre, 1,500 cavalry and 5,000 infantry, smashed the Royalist cavalry-1,700 lancers—and 7,000 infantry. More than 3,000 Royalists were killed; Protestant deaths totaled 200. 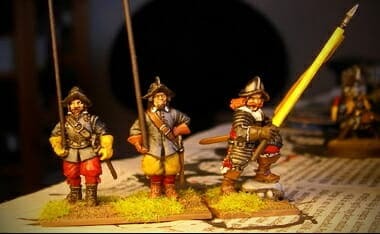 Especially effective against the Royalist was the massed fire of the Protestant arquebuses, primitive muskets. Despite the Protestant victory at Coutras, the Catholics under Henry of Guise prevailed at Vimoy and Auneau and checked the advance of a German army marching into the Loire Valley to aid to Protestants. Henry’s next victory was in Paris, where he forced the king to capitulate in May 1588. In subsequent intrigues, Henry de Guise and his brother Cardinal Louis I de Guise (1527-78) were assassinated. Fleeing the Catholics’ rage over the murders, Henry Ill sought refuge with Protestant leader Henry of Navarre. The king failed to find perma­nent safety and was assassinated, stabbed to death, by a Catholic monk on August 2, 1589. On his deathbed, the king named Henry of Navarre his successor. The Catholics refused to acknowledge him king, insisting instead that Cardinal Charles de Bourbon (1566-1612) was the right­ful ruler of France. This conflict sparked the NINTH WAR OF RELIGION. The naming of Henry of Navarre (1553-1610) as successor to the French throne sparked the final War of Religion between Protestant Huguenots and Catholics in France. Insisting that Charles, duke de Bourbon (1566-1612), was the rightful successor to Henry III (1551-89), the Catholics enlisted the aid of the Spanish. Charles, duke of Mayenne (1554-1611), the younger brother of Henry of Guise (1555-88), led the Catholic efforts. At the Battle of Argues on September 21,1589, Henry of Navarre (1553-1660) ambushed Mayenne’s army of 24,000 French Catholic and Spanish soldiers. Having lost 600 men, Mayenne withdrew to Amiens, while the victorious Navarre, whose casualties numbered 200 killed or wounded, rushed toward Paris. A Catholic garrison near Paris repulsed Navarre’s advance on November 1, 1589. Not to be daunted in his quest for the throne, Henry withdrew but promptly proclaimed himself Henry IV and established a temporary capital at Tours. Henry of Navarre won another important battle at Ivry on March 14, matching 11,000 troops against Mayenne’s 19,000. Mayenne lost 3,800 killed, whereas Navarre suffered only 500 casualties. 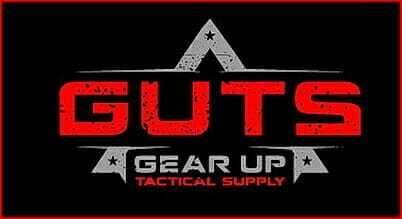 Civil war continued unabated. Between May and August 1590, Paris was reduced to near starvation dur­ing Navarre’s siege of the city. Maneuvers continued, especially in northern France until May 1592; however, in July 1593 Henry of Navarre reunited most of the French populace by declaring his return to the Catholic faith. His army then turned to counter a threat of inva­sion by Spain and the French Catholics allied with Mayenne. On March 21, 1594, Henry of Navarre entered Paris in triumph and over the next few years battled the invading Spanish: at Fontaine-Francaise on June 9, 1596, at Calais on April 9, 1596, and at Amiens on September 17, 1596. No further major campaigns ensued. 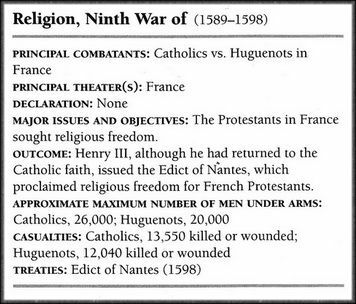 On April 13, 1598, Henry of Navarre ended the decades of violence between the Catholics and the Protes­tants by issuing the Edict of Nantes, whereby he granted religious freedom to the Protestants. Then on May 2, 1598, the war with Spain ended with the Treaty of Vervins, whereby Spain recognized Henry as king of France. The next major conflict between the Catholics and Protestants in France occurred 27 years later when the Protestants rose in revolt in 1625 and the English joined their cause in the ANGLO-FRENCH WAR (1627-1628). 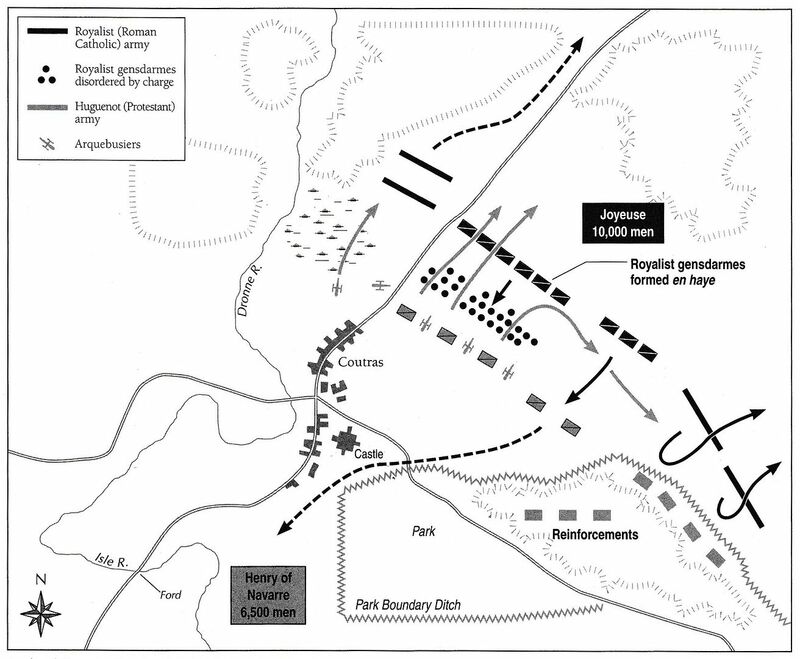 ➤ Further reading: R. J. Knecht, The French Civil Wars, 1562-1598 (New York: Pearson Education, 2000); R. J. Knecht and Mabel Segun, French Wars of Religion (New York: Addison-Wesley Longman, 1996). A recent comprehensive compilation of the history of human warfare, Encyclopedia of Wars by Charles Phillips and Alan Axelrod documents 1763 wars, of which 123 have been classified to involve a religious conflict. 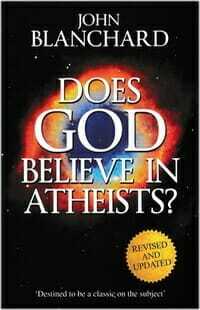 So, what atheists have considered to be ‘most’ really amounts to less than 7% of all wars. It is interesting to note that 66 of these wars (more than 50%) involved Islam, which did not even exist as a religion for the first 3,000 years of recorded human warfare. Even the Seven Years’ War, widely recognized to be “religious” in motivation, noting that the warring factions were not necessarily split along confessional lines as much as along secular interests. And the Thirty Years’ War cannot be viewed as “religious” in that you should find certain aspects if this were the case. For instance, professor Cavanaugh offers the following short critique after a long list of historical instances [included below] building-up-to and during the Thirty Years’ War. Not only were students able to demonstrate the paucity of evidence for this claim, but we helped them discover that the facts of history show the opposite: religion is the cause of a very small minority of wars. Phillips and Axelrod’s three-volume Encyclopedia of Wars lays out the simple facts. In 5 millennia worth of wars—1,763 total—only 123 (or about 7%) were religious in nature (according to author Vox Day in the book The Irrational Atheist). If you remove the 66 wars waged in the name of Islam, it cuts the number down to a little more than 3%. A second [5-volume] scholarly source, The Encyclopedia of War edited by Gordon Martel, confirms this data, concluding that only 6% of the wars listed in its pages can be labelled religious wars. Thirdly, William Cavanaugh’s book, The Myth of Religious Violence, exposes the “wars of religion” claim. And finally, a recent report (2014) from the Institute for Economics and Peace further debunks this myth. If the above instances of war making—in which members of the same church fought each other and members of different churches collaborated—undermine the standard narrative of the wars of religion, the absence of war between Lutherans and Calvinists also undermines the standard tale. If theo­logical difference tends toward a war of all sects against all, we should expect to find Lutheran-Calvinist wars, but in fact we find none. 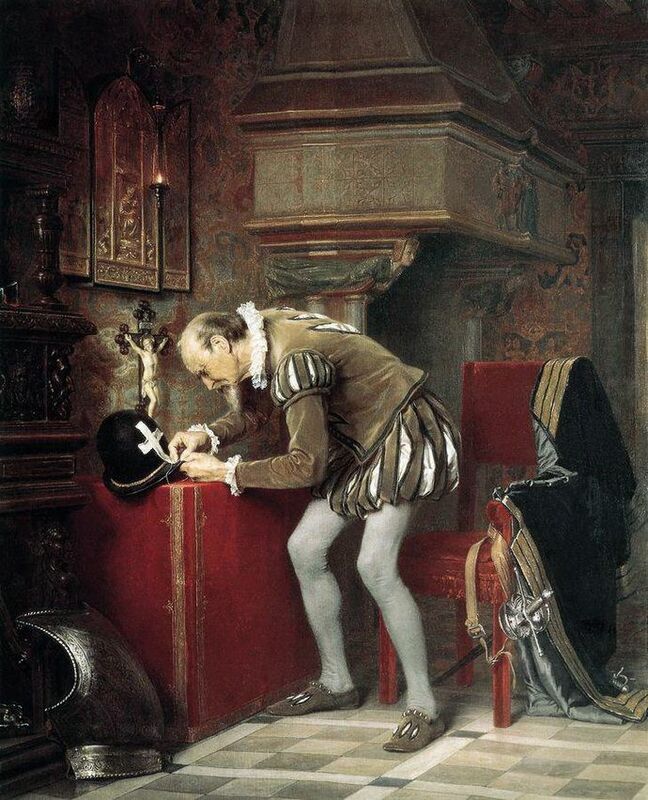 Although there were internal tensions in some principalities between Lutheran princes and Calvinist nobility or Calvinist princes and Lutheran nobility, no Lutheran prince ever went to war against a Calvinist prince. The absence of such wars cannot be attributed to the similarity of Lutheranism and Calvinism. There were sufficient theological differences to sustain a permanent divide between the two branches of the Reformation. Such differences were serious enough to produce sporadic attempts by the civil authorities to enforce doctrinal unifor­mity. In the decades following Phillip Melanchthon’s death in 1560, there was an effort to root out “Crypto-Calvinists” from the ranks of Lutheranism. The rector of the University of Wittenberg, Caspar Peucer, was jailed for Crypto-Calvinism from 1574 to 1586; Nikolaus Krell was executed for Crypto-Calvinism in Dresden in 1601. Many Crypto-Calvinists among the Lutherans were forced to relocate to regions friendlier to Calvinism, such as Hesse-Kasse1. However, the fact that Lutheran-Calvinist tensions played no part in the wars of religion indicates at minimum that significant theological differences in the public realm did not necessarily produce war in sixteenth- and seventeenth-century Europe. There simply was no war of all sects against all…. B. The primary cause of the wars was religion, as opposed to merely political, economic, or social causes. Protestants and Catholics not only killed each other, but they did so for religious—not political, economic, or social—reasons. There are two immediate reasons that this would not be an adequate response. First, the above list contains more than just a few isolated instances. In the case of the Thirty Years’ War, for example, the entire latter half of the war was primarily a struggle between the two great Catholic powers of Europe: France, on the one hand, and the two branches of the Habsburgs, on the other. Second, the above list contains more than just exceptions; if the wars in question are indeed wars of religion, then the instances above are inexplicable exceptions, unless other factors are given priority over religion. Why, in a war over religion, would those who share the same religious beliefs kill each other? Why, in a war over religion, would those on opposite sides of the religious divide collaborate? If the answer is that people prioritized other concerns over their religious views, then it does not make sense to call them wars of religion. William T. Cavanaugh, The Myth of Religious Violence (New York, NY: Oxford University Press, 2009), 141-142, 146, 150-152. OUTCOME: The Empire became fragmented, with the emperor losing most of his political authority within Germany but consolidating his hold over his own territories; religion ceased to be a major precipitant of political conflict; Germany, although devastated by 30 years of conflict, enjoyed internal peace for almost a century; the foreign powers all gained their objectives, although the cost of doing so provoked serious political strains in most of them; Sweden briefly became a great power. APPROXIMATE MAXIMUM NUMBER OF MEN UNDER ARMS: The Imperial army commanded by Wallenstein in North Germany in 1628-29 probably approached 200,000 men; Gustavus Adolphus probably directed the operations of 120,000 men in 1631-32; France maintained some 130,000 men, at least on paper, in 1635-36. Total number of men in battle, however, rarely exceeded 20,000 per side and normally numbered 10,000 or less—roughly half of them cavalry. CASUALTIES: Perhaps 500,000 soldiers took part in the war, of whom perhaps two-thirds died in service; in addition civilian losses amounted to perhaps 4 million-20 percent of the total population of the Empire. TREATIES: Hague Alliance (December 9, 1625); Peace of Lubeck (July 7, 1629); Truce of Altmark (September 26, 1629); Heilbronn League (April 23, 1633); Peace of Prague (May 30, 1635); Treaty of Hamburg (March 15, 1641); Peace of Westphalia (October 24, 1648). Alan Axelrod & Charles Phillips, Encyclopedia of Wars, vol III (New York, NY: Facts on File, 2005), cf, Thirty Years’ War, 1140-1141. Okay, now for the in-depth items to deal with… remember, only “A” and “B” are responded to. Take note as well that the death toll of secular — non-religious — governments in the 20th Century alone are included (the graphic is linked) at the end. The primary cause of the wars was religion, as opposed to merely political, economic, or social causes. Protestants and Catholics not only killed each other, but they did so for religious—not political, economic, or social—reasons. Religious causes must be at least analytically separable from political, eco­nomic, and social causes at the time of the wars. Although the historical reality is inevitably complex, and people’s motives are often mixed, we must be able, at least in theory, to separate religious causes from political, economic, and social causes. The rise of the modern state was not a cause of the wars, but rather provided a solution to the wars. The transfer of power from the church to the state was necessary to tame the disruptive influence of religion. As we have seen, there are two versions of this narrative. 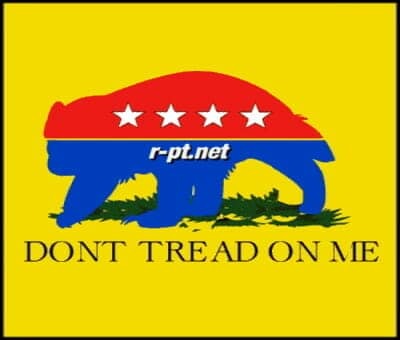 In one, the liberal state tames religion by separating church and state and removing religion from the public realm. In the other, the absolutist state enforces political unity by absorbing the church. For contemporary liberal political theorists of the latter type, absolutism is a necessary but temporary stage on the way to liberalism. We will now see how each of these components stands up to recorded his­tory. This is important, given that the tellings of the narrative we examined above tend not to look very closely at history. Toulmin’s, Skinner’s, and Pocock’s books contain scattered references in the notes to contemporary histories of the religious wars. None of the other figures cites, either in the main text or the footnotes, any work by any historian of the European wars of religion. The early decades of the Reformation saw Catholic France in frequent wars against the Catholic emperor. The wars began in 1521, 1527, 1536, 1542, and 1552; most lasted two to three years.95 Charles V was at war twenty-three of the forty-one years of his reign, sixteen of them against France.96 Although most of these wars predate what are commonly called the wars of religion, they come in the wake of the Reformation and underscore the fact that the first decades of religious difference in Europe did not produce war between sects. War continued to be based on other factors. If the above instances of war making—in which members of the same church fought each other and members of different churches collaborated—undermine the standard narrative of the wars of religion, the absence of war between Lutherans and Calvinists also undermines the standard tale. If theo­logical difference tends toward a war of all sects against all, we should expect to find Lutheran-Calvinist wars, but in fact we find none. Although there were internal tensions in some principalities between Lutheran princes and Calvinist nobility or Calvinist princes and Lutheran nobility,167 no Lutheran prince ever went to war against a Calvinist prince. The absence of such wars cannot be attributed to the similarity of Lutheranism and Calvinism. There were sufficient theological differences to sustain a permanent divide between the two branches of the Reformation. Such differences were serious enough to produce sporadic attempts by the civil authorities to enforce doctrinal unifor­mity. In the decades following Phillip Melanchthon’s death in 1560, there was an effort to root out “Crypto-Calvinists” from the ranks of Lutheranism. The rector of the University of Wittenberg, Caspar Peucer, was jailed for Crypto-Calvinism from 1574 to 1586; Nikolaus Krell was executed for Crypto-Calvinism in Dresden in 1601. Many Crypto-Calvinists among the Lutherans were forced to relocate to regions friendlier to Calvinism, such as Hesse-Kasse1.168 However, the fact that Lutheran-Calvinist tensions played no part in the wars of religion indicates at minimum that significant theological differences in the public realm did not necessarily produce war in sixteenth- and seventeenth-century Europe. 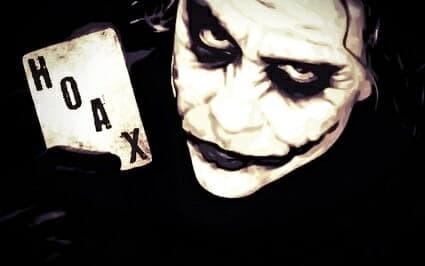 There simply was no war of all sects against all. The long list above is almost certainly incomplete. It is gleaned from a reading of some standard histories of the wars of religion. Undoubtedly, a pro­fessional historian of this period could add more instances of war between members of the same church and collaboration in war among members of different churches. Undoubtedly as well, we could compile an even longer list of acts of war between Catholics and Protestants in the sixteenth and seven­teenth centuries. Nevertheless, we must at least observe at this point that the first component of the myth (A) must be significantly qualified by all of the above instances in which it does not hold. As we will see, once we consider the implications of the above list, problems arise with the other components of the myth as well. May we not simply conclude that the above list contains exceptions to the gen­eral rule of war between different religions in this era, but the standard nar­rative of the wars of religion still holds? That is, may we not claim that the majority of violence was Catholic-Protestant, and so, granting the above excep­tions, the standard narrative is valid? There are two immediate reasons that this would not be an adequate response. First, the above list contains more than just a few isolated instances. In the case of the Thirty Years’ War, for example, the entire latter half of the war was primarily a struggle between the two great Catholic powers of Europe: France, on the one hand, and the two branches of the Habsburgs, on the other. 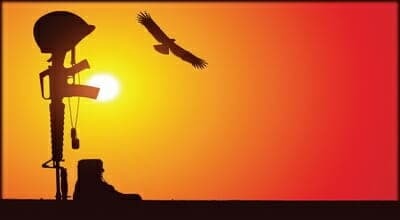 Second, the above list contains more than just exceptions; if the wars in question are indeed wars of religion, then the instances above are inexpli­cable exceptions, unless other factors are given priority over religion. Why, in a war over religion, would those who share the same religious beliefs kill each other? 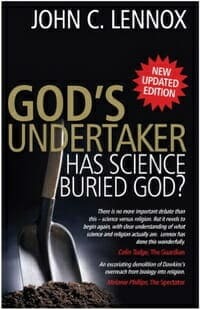 Why, in a war over religion, would those on opposite sides of the reli­gious divide collaborate? If the answer is that people prioritized other concerns over their religious views, then it does not make sense to call them wars of religion. Imagine I am writing a history of World War I. I am telling the standard story of the war as a struggle between two sets of nations, fueled by com­plex national aspirations, when I uncover a startling fact: the English coun­ties of Somerset, Kent, Durham, Shropshire, Norfolk, Suffolk, Cumbria, and Cornwall entered World War I on the side of the Kaiser. Leaders in each of these counties declared their allegiance to the German cause, and thousands of troops were sent by ship to Hamburg to join the German forces fighting on the Western Front. I could respond to this discovery by noting these odd exceptions, but pointing out that the majority of English counties fought for the Allied powers, so the basic plotline of the war is unaltered. If I were a good historian, however, I would most likely drop everything and try to find a nar­rative that would take these cases into account. Perhaps nationalism was not the only force driving this war. What motivated the leaders of these counties? Did the troops from these counties go out of conviction or desperation? 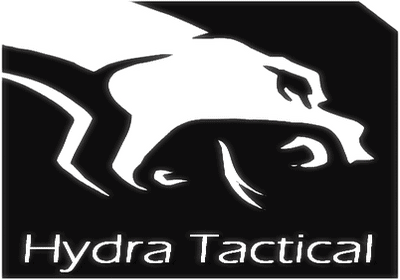 Were they volunteers, conscripts, or mercenaries? What grievances did these coun­ties have against London that made them unwilling to fight for the king? What other factors besides nationalism were at work in this war? In the actual case of the sixteenth- and seventeenth-century wars, histo­rians generally deal with the facts from the list above by acknowledging that other factors besides religion were at work in the wars of religion—political, economic, and social factors. The question then becomes one of the relative importance of the various factors. Are political, economic, and social factors important enough that we are no longer justified in calling these wars “of religion”? The above list consists of acts of war in which religion as the most important motivating factor must necessarily be ruled out. But once religion is ruled out as a significant factor from these events, the remainder of the acts of war—those between Protestants and Catholics—become suspect as well. Were other factors besides religion the principal motivators in those cases too? If Catholics killed Catholics for political and economic reasons, did Catholics also kill Protestants for political and economic reasons? This divide is apparent if we look at twentieth-century historiography of the French wars. For much of the century, historians downplayed the role of religion in favor of supposedly more fundamental political, economic, and social causes. J.-H. Mariejol in 1904 stressed the role of the dissident nobility of the sword who joined the Huguenot movement to avenge grievances against the monarchy and the church: “Whether it wanted to or not, [the Huguenot church] served as a rallying point for all kinds of malcontents. It ceased being uniquely a church; it became a party.”171 Lucien Romier—whose two-volume 1913 study Les Origines politiques des guerres de religion set the tone for much further historiography of the period—also focused on the role of dissident nobility and found their theological bona fides wanting: “In short, the nobility were thinking of their own interest and were not particularly concerned with bringing it into accord with any precise doctrine. 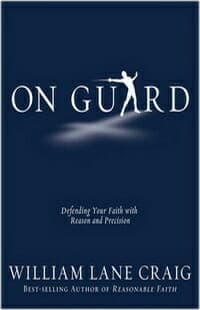 It cannot be denied that self­ish passion and sometimes unrestrained greed persuaded many of the nobil­ity and captains to join the Protestants.”172 James Westfall Thompson’s 1909 book, The Wars of Religion in France, which was for decades the standard text in English, took a similar approach. Thompson wrote, “Although the purposes of the Huguenots were clandestinely more political than religious, it was expe­dient to cloak them under a mantle of faith.”173 John Neale located the root of the religious wars in the weakness of the French monarchy.174 As for the dis­sidents who opposed the monarchy, he concluded, “Generally speaking, social discontent found an outlet for itself in religious and political unrest.”175 Henri Drouot’s 1937 work on the Catholic League in Burgundy saw religious factors as merely a cover for class tensions: “With the economic and monetary crisis [of the late 1580s], with civil war replacing foreign war and internal peace, social mobility ceased. Classes were more clearly defined, and above all, social tensions arose and festered, social tensions that religion could disguise in its own colors and intensify with fanaticism, but which were really the basis of local tensions at the time of the League.”176 Henri Hauser wrote of the outbreak of violence in 1562, “Elements of social and political discontent were to become much more significant than religious faith in the complex attitudes of the new Protestants, and thenceforth it became possible to speak of ‘political’ as well as of ‘religious’ Huguenots.”177 In the 19 6os, George Livet’s Les Guerres de religion identified the “economic and social crisis” of France in the sixteenth century as the principal cause of the wars.178 Hauser’s distinction between types of Huguenots indicates that religion was not entirely forgotten as a motivating force, and some mid-twentieth-century historians, such as Robert Kingdon and N. M. Sutherland, maintained the importance of religious factors.179 Until the 1970s, however, the dominant opinion tended to push aside religion in its search for the underlying material causes of the wars. We have, then, one group of historians that dismisses religion as an important factor in the French civil wars of the sixteenth century, and another group that wants to reclaim religion as an important driving force among oth­ers in these conflicts. (We should note that similar conflicts of interpretation are present in the historiography of the other wars of religion beyond France.) We must at least note that historians have given us ample reason to doubt the straightforward tale of theological zealotry run amok that Voltaire, Rawls, Shklar, and others tell. No academic historian, with the possible exception of Crouzet, tells the story that way. With regard to component (B) of the myth of the wars of religion, then, we must conclude that the myth is at best a distorted and one-dimensional narrative; at worst, it eliminates so many of the relevant political, economic, and social factors as to be rendered false. But is the solution simply to seek balance among the various factors? Barbara Diefendorf’s question is an apt one: “Must we go from an overly polit­ical interpretation of the period to one that seems to offer very little room for politics, at least as traditionally viewed?” Should we, like Diefendorf, seek a middle ground between political and religious interpretations? Or is there a problem with the way politics and religion have been, in Diefendorf’s phrase, “traditionally viewed”? William T. Cavanaugh, The Myth of Religious Violence (New York, NY: Oxford University Press, 2009), 141-155. The advent of nihilism is in Nietzsche’s opinion inevitable. And it will mean the final overthrow of the decadent Christian civilization of Europe. At the same time it will clear the way for a new dawn, for the transvaluation of values, for the emergence of a higher type of man. For this reason “this most gruesome of all guests”, who stands at the door, is to be welcomed. 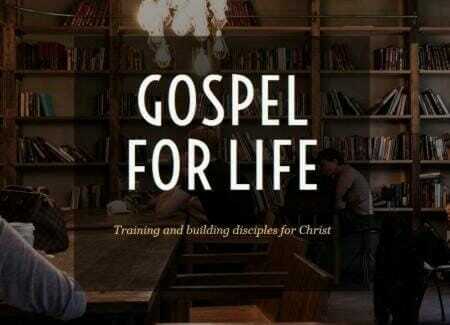 The Bible does not teach the horrible practices that some have committed in its name. 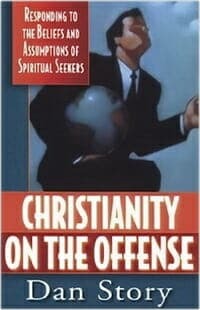 It is true that it’s possible that religion can produce evil, and generally when we look closer at the details it produces evil because the individual people [Christians] are actually living in rejection of the tenets of Christianity and a rejection of the God that they are supposed to be following. So it [religion] can produce evil, but the historical fact is that outright rejection of God and institutionalizing of atheism (non-religious practices) actually does produce evil on incredible levels. 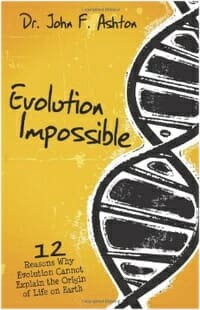 We’re talking about tens of millions of people as a result of the rejection of God. 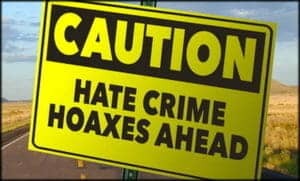 For example: the Inquisitions, Crusades, Salem Witch Trials killed about anywhere from 40,000 to 80,000 persons combined (World Book Encyclopedia and Encyclopedia Americana), and the church is liable for the unjustified murder of about (taking the high number here) 300,000-women over about a 300 year period. A blight on Christianity? Certainly. Something wrong? Dismally wrong. A tragedy? Of course. Millions and millions of people killed? No. The numbers are tragic, but pale in comparison to the statistics of what non-religious criminals have committed); the Chinese regime of Mao Tse Tung, 60 million [+] dead (1945-1965), Stalin and Khrushchev, 66 million dead (USSR 1917-1959), Khmer Rouge (Cambodia 1975-1979) and Pol Pot, one-third of the populations dead, etc, etc. 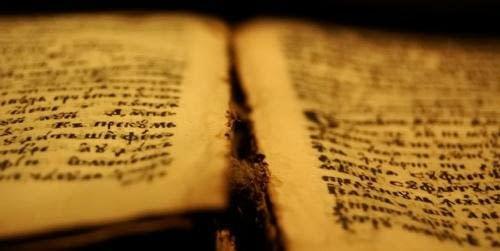 The difference here is that these non-God movements are merely living out their worldview, the struggle for power, survival of the fittest and all that, no evolutionary/naturalistic natural law is being violated in other words (as non-theists reduce everything to natural law — materialism). However, and this is key, when people have misused the Christian religion for personal gain, they are in direct violation to what Christ taught, as well as Natural Law. Adolf Hitler, Mein Kampf, translator/annotator, James Murphy [New York: Hurst and Blackett, 1942], pp. 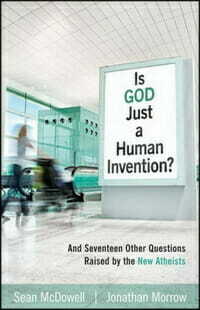 161-162; found in: Norman L. Geisler & Peter Bocchino, Unshakeable Foundations: Contemporary Answers to Crucial Questions About the Christian Faith [Minneapolis: Bethany House, 2001], 206.